Welcome to the first chapter of the rest of my life in quintessential Brazil. THE END IS THE BEGINNING OF ALL GREAT THINGS. Filmed by Craig Cunningham, Sam Medysky, Nina Font, Santi Font and Vincent Bergeron. Still photography by Vincent Bergeron. 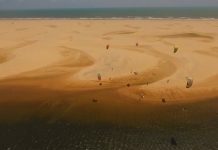 North Kiteboarding – Ion – Ocean Sunglasses.